A little collection of some dev tools I personally use. 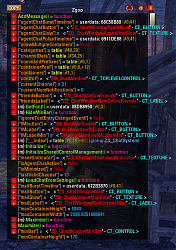 Created first to do not have 10 devs addons in my addon list. Zgoo : A powerfull data inspection tool. Use /zgoo or /zgoo variableName. ReloadUI : Set a Keybind, for my part, it's F12. 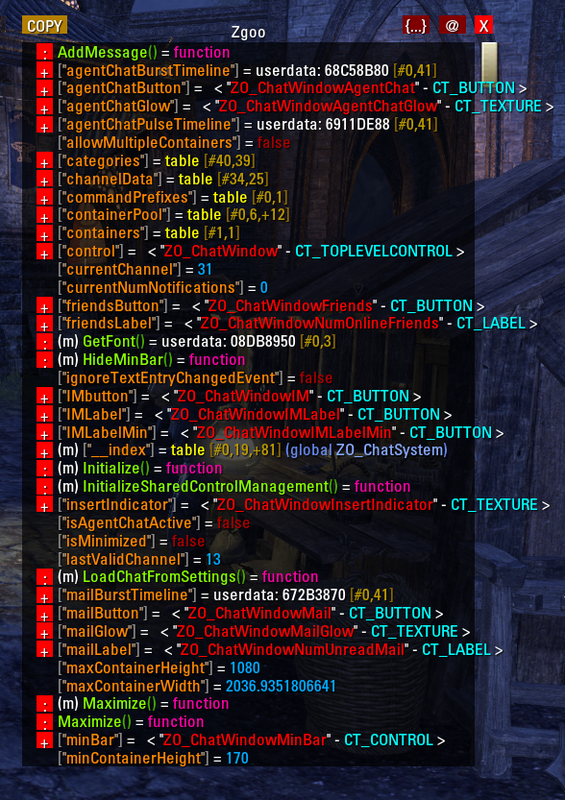 Lua memory usage : Display in chat the Lua memory usage (set a keybind - I've set it to F8). Zgoo mouse : If you want info on the Object your mouse is actually hovering on, you can /zgoo mouse, but sometimes, you'll need to get it without typing the chat command, so set a keybind. Slash404 : If you misstype a slashcommand. Many thanks to original authors. Feel free to ask requests or personalize it as you like if you wrote an useful script which could help everyone. On my way to add a dumper throught savedvars, like garkin's dumper, a bit more evolved. Maybe add a Lua memory consumption in realtime. Other things. I don't know. I didn't yet looked at bugcatcher, it could maybe be useful. Please consider asking feature only if you are an addon author, thanks. If you want to add feature, tweak it a bit, just PM and I'll give you rights to modify this little collection of tools to help. Zgoo included is now www.esoui.com/downloads/info1624-ZgooCC.html from Rhyono, many thanks to him. I'll try to have a look on zgoo forks in order to see if we can improve data analysis. Just wanted to let you know that I updated Slash 404. The version you have in DevTools doesn't work anymore since the last update. Hey there, only an API bump, but I think i'll add some useful tools, such 2 circonian's ones if he's ok. (texture it and the one which display borders for drawnng UI) I don't remember well which add is this one. Feel free to ask something useful in the package. Control Outlines is the other one. Yeah Its fine if you want to add them. Last edited by circonian : 11/02/15 at 03:55 PM. just popped into my head: a keybind for gamepad mode would be nice. I'll try to put it together later if one of you isn't already sitting on it . Last edited by Randactyl : 11/02/15 at 02:28 PM. You could add sidTools if you want. But you should wait for a while as I'll update them in a bit. Ahw yes, your event listener is nice. And I forget but maybe slash404 aswell, it's a tiny one but very useful for a lazy dev. Last edited by Ayantir : 11/02/15 at 06:28 AM. Or use your TextEditor like you're currently doing until Philgo decides to spend more time to coding again. And then you'll realize that playing the game > making virtual money ingame. If not: Outch, but everyone is defining "fun" in other manners. Why? Doesn't MM allow you to delete sales? If not why not ask for that ability? I'm not familiar with MM, but looking at the pictures it seems it all ready has a UI that lists all of the sales. It doesn't sound like it would be difficult to just add an option to right click on one (or add a button) to delete the selected sale item data. I'm not sure why you would want to doctor that data anyway. It's used for trend data. so i need again to edit saved variales and ADD fake sales to adjust the price. Last edited by Baertram : 08/31/15 at 04:24 PM. Last edited by QuadroTony : 08/27/15 at 12:48 AM. Last edited by QuadroTony : 08/26/15 at 01:42 AM. 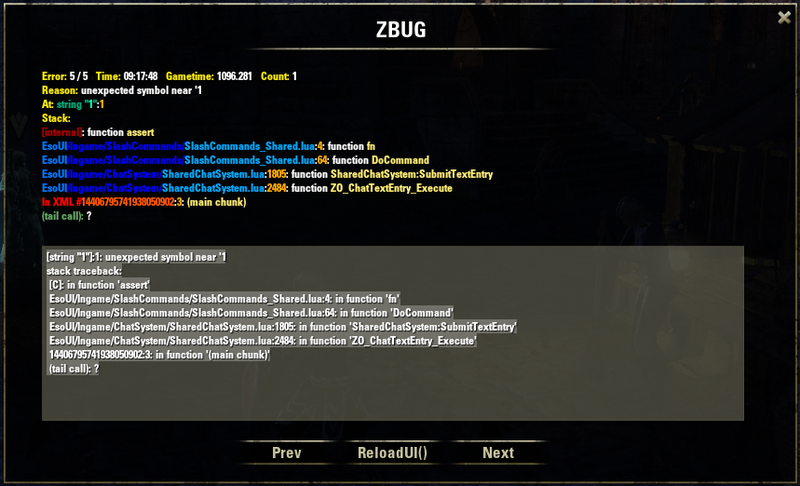 Just fixed zbug because this error was really boring. 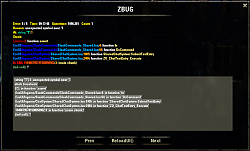 I've rebuilt a bit the zbug UI too, because copypasting is always useful. Feel free to fork, or adjust it as you want.